Irvine H. Millgate was a professor at Northwestern University in Illinois when he came up with the idea for "The Molten Meteor," a proposed film about a giant gob of reddish, jellylike goo from outer space that absorbs everything in its path, growing ever larger as it goes. In 1958, a screenplay was thrown together by first-timer Theodore Simonson and longtime B movie actress Kay Linaker, who'd dabbled in screenwriting with an episode of United States Steel Hour a few years earlier under her pen name, Kate Phillips. Ideas for a shorter, more attention-grabbing title were bandied about; "The Glob" was considered until they found out John O'Reilly and Pogo cartoonist Walt Kelly had already published a children's book with that title. One slight adjustment resulted in the name of a creature that would frighten a billion youngsters, myself included. Who could sleep knowing that at any moment The Blob might ooze under the door or through any crack, no matter how small, and devour an entire person in seconds? Not I! Irvin S. Yeaworth, Jr. was hired to directed the low-budget film. The cast included Steven McQueen, a young up-and-comer with several dramatic television appearances under his belt and a supporting role in Allied Artists' Never Love a Stranger just wrapped. Aneta Corsaut, a young actress with a couple of previous TV credits, was his leading lady. Filming took place in and around Valley Forge, Pennsylvania, where the percentage of hysterical children certainly must have been higher than the nation's average for several years following the Paramount Pictures release. Riding that thin line between scary and silly, as many horror films of the era did, there were, however, a few aspects of the production that stood above the norm: McQueen, in his first starring role, possessed a natural ease in front of the camera indicating potential for more substantial future projects; the special effects of the Blob itself, while not of the highest caliber, were of sufficient quality to achieve the desired, unsettling effect without eliciting laughter from more mature viewers (though the mere idea of the monster is scarier than its realization); and then there was that theme song...a danceable ditty with some sizzling sax work and a 'Beware of the Blob!' hook that became a pop culture catchphrase. The anomalous assignment of composing such a wacky theme song fell to a team consisting of a veteran and a relative newcomer. A songwriter since the early 1940s, Mack David had already penned several hit songs by '58, including "Bibbidi-Bobbidi-Boo" from Disney's Cinderella, which (along with cowriters Al Hoffman and Jerry Livingston) earned him an Oscar nomination for Best Song in 1950. David's partner in Blobulism, rookie Burt Bacharach, was coming off his first two chart hits as a songwriter, Marty Robbins' "The Story of My Life" and Perry Como's "Magic Moments." 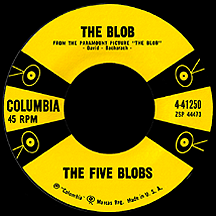 "The Blob" was certainly outside the usual realm of either writer, but they got into the spirit of it and came up with a song that contrasted the movie's jolting, gelatinous subject matter. With an instrumental saxophone solo by session musician Paul Roberts along the same lines as The Champs' recent number one hit "Tequila," the song's sparse lyrics were delivered with a lightness of attitude: '...it creeps, it leaps, it glides and slides across the floor, right through the door, and all along the wall, a splotch, a blotch...,' while making a point about what this self-mobilizing, ultra-sticky, thicker-than-Jell-O menace was capable of. Bernie Nee was the singer who delivered the disquieting lyrics so expertly. A New York session singer, he had been signed to Columbia and had several single releases between '56 and '58, working with orchestra leaders like Ray Conniff and Percy Faith while trying his hand at any style of music that might sell records, including folk ("Hey Liley, Liley Lo"), pop ("(When Your Heart Is) Feeling Foolish in Brazil," "Make Me Yours"), C&W ("Country Music Holiday") and even rock and roll ("Lend Me Your Comb," more significantly recorded by Carl Perkins). Nothing worked. So when the "Blob" opportunity came up he took a shot, in spite of Columbia's strategy of crediting the artist as The Five Blobs. Multitracking was used to create a group sound and, timed to the movie's release (an alternate version of the original recording plays over the opening credits), the single hit the charts in early October, leeching onto the number 33 position a month later, suggesting a sales surge had occurred just before Halloween. A quickly-thrown-together cover version was released by The Zanies on the Era label, but it was Bernie's Five Blobs original that dominated. According to plan, the record company refused to give Nee any credit for the hit record. Frustrated, he took out an ad in the trades heralding "A Great New BLOB (crossed out, make that) STAR on the Horizon - Bernie Nee is the Five Blobs! The Secret is Out!" Almost immediately, his association with Columbia Records was history. He signed with the much smaller Joy Records, but their only use for him was to try to capitalize on the hit single; with no other offers in sight, he went along with it. 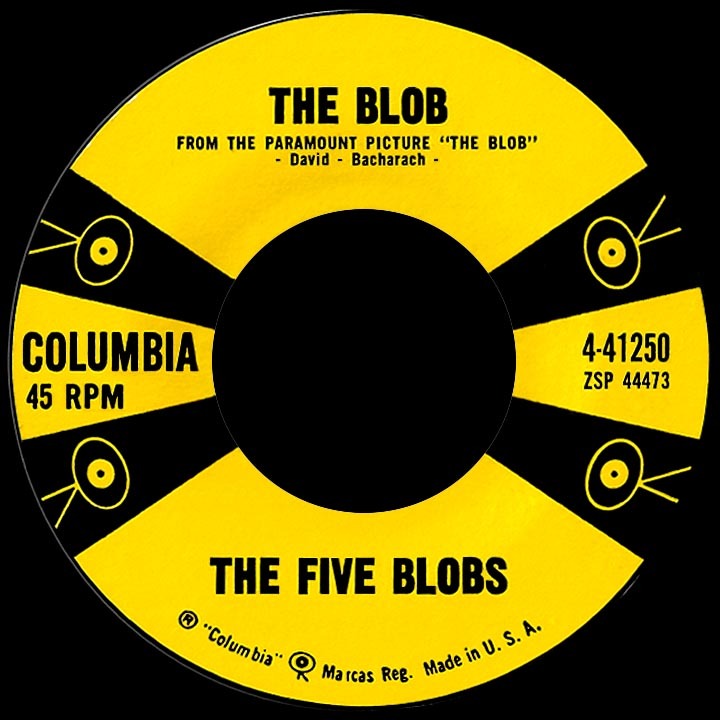 "From the Top of Your Guggle (To the Bottom of Your Zooch)" and "Rockin' Pow Wow," both with the familiar "Blob" vocal overlay sound, were released as the Five Blobs in early 1959; a follow-up, "Young and Wild" (another David-Bacharach track), using the same strategy, came on its heels, but neither succeeded in putting him back on the charts. Nee's moment in the spotlight had been an anonymous one, and he returned to session work. The film's director, Irvin Yeaworth, reprised his box office Blobius maximus with two barely-noticed spine-chillers, 4D Man in '59 and Dinosaurus! in '60. Aneta Corsaut worked steadily as an actress, mostly on television, for the next three decades; her most memorable role came as schoolteacher Helen Crump (later Sheriff Andy Taylor's bride) on The Andy Griffith Show from 1963 through 1968. Steven dropped the "n" and, as Steve McQueen, roamed the wild west for three years on the CBS series Wanted: Dead or Alive as bounty hunter Josh Randall. After that he became one of Hollywood's hottest stars, exuding extreme coolness in more than two dozen films including The Magnificent Seven, The Great Escape, The Sand Pebbles and Bullitt. He died in 1980 at age 50. Mack David continued writing songs and bagged seven more Oscar nominations along the way. Burt Bacharach had a long partnership with Mack's younger brother Hal David; the two wrote dozens (if not hundreds) of hits together, including a sizeable string for Dionne Warwick. 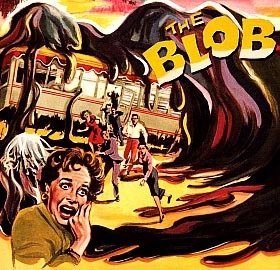 As for The Blob, I hope that mass of ravenous Silly Putty is embedded deep in the frozen Arctic tundra (since that's where they dropped it, wrapped up like a care package, at the end of the movie). If Earth's polar ice caps should ever melt, we're all in deep trouble.